Nephrogenic diabetes insipidus (NDI) is a disorder in which a defect in the small tubes (tubules) in the kidneys causes a person to pass a large amount of urine and lose too much water. Normally, the kidney tubules allow most water in the blood to be filtered and returned to the blood. NDI occurs when the kidney tubules do not respond to a hormone in the body called antidiuretic hormone (ADH), also called vasopressin. 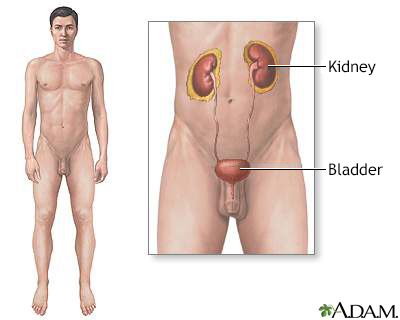 ADH normally prompts the kidneys to make the urine more concentrated. As a result of the defect, the kidneys release too much water into the urine. This causes the body to produce a large quantity of very dilute urine. NDI is rare. Congenital nephrogenic diabetes insipidus is present at birth. It is a result of a defect passed down through families. Men are usually affected, though women can pass this gene on to their children. You may have intense or uncontrollable thirst, and crave ice water. You will produce large amounts of urine, usually more than 3 liters, and up to 15 liters per day. The urine is very dilute and looks almost like water. You may need to urinate every hour or even more, even during the night when you are not eating or drinking as much. The health care provider will examine you and ask about your or your child's symptoms. The osmolality urine test measures the concentration of particles in urine. Osmolality can also be measured using a blood test. Urine specific gravity is a laboratory test that shows the concentration of all chemical particles in the urine. The goal of treatment is to control the body's fluid levels. A large amount of fluids will be given. The amount should be about equal to the amount of water being lost in the urine. If the condition is due to a certain medicine, stopping the drug may improve symptoms. But, do NOT stop taking any medicine without first talking to your provider. Medicines may be given to improve symptoms by reducing urine output. If a person drinks enough water, this condition will not have much effect on the fluid or electrolyte balance of the body. Sometimes, passing a lot of urine for a long time can cause other electrolyte problems. If the person does not drink enough fluids, high urine output may cause dehydration and high levels of sodium in the blood. NDI that is present at birth is a long-term condition requiring lifelong treatment. Call your provider if you or your child has symptoms of this disorder. Congenital NDI cannot be prevented. Treating the disorders that can lead to the acquired form of the condition may prevent it from developing in some cases. Breault DT, Majzoub JA. Diabetes insipidus. In: Kliegman RM, Stanton BF, St. Geme JW, Schor NF, eds. Nelson Textbook of Pediatrics. 20th ed. Philadelphia, PA: Elsevier; 2016:chap 558. The urinary system is made up of the kidneys, ureters, urethra and bladder.